The play-in games—sorry, "first round"—are halfway done, so tomorrow sees the start of the traditional and comprehensible 64-team bracket that makes up March Madness. 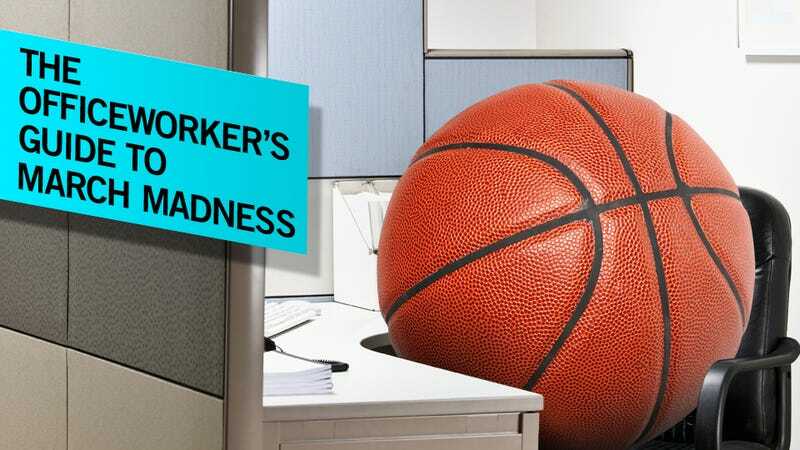 And there's nothing more traditional than blowing off productivity to watch the tournament, four games at a time, from the relative comfort of your office. Here's everything you need to know to be ready for tip-off at 12:15 Eastern, including the most significant change to this year's on-demand viewing options—it might no longer be free. If you're planning to watch on TV, then you're somebody's boss and have your own office, so good for you. All the games will be aired on CBS and the Turner family of networks, namely TNT, TBS and truTV. The full channel schedule for Thursday and Friday can be found below. If you want to watch on your computer or mobile device, you're like most of us cubicle dwellers and you'll be relying on the streams provided by CBS, Turner and the NCAA. Formerly March Madness On Demand, the multi-platform application has been rebranded March Madness Live, and it's very different. Still available on the computer, iPhone, iPad, and select Android phones, it's no longer as simple as click-and-watch. To watch games online, you'll have to authenticate yourself as a cable subscriber, usually by entering the account number on your cable bill. Be sure to have this info handy before you leave work Thursday morning. (You may have to authenticate at the networks' individual sites, ncaa.tnt.tv, ncaa.tbs.com, ncaa.trutv.com.) If you do not have your account number, or are not a cable subscriber, you'll have to purchase an all-access pass to March Madness Live for $3.99—which also lets you watch on your phone or tablet. All tournament games airing on CBS will be available for free online, with no need for authentication. There will undoubtedly be various illegal streams up and running throughout the day, which should be easily located via a Twitter search or in the comments below. If you're planning to listen to the tournament, Dial Global Sports (formerly Westwood One) will be doing the radio broadcasts for every game. Go here to find your local over-the-air affiliate, which will have the closest game at the moment, and here to see the schedule for individual games on SiriusXM satellite radio—also available online. If you just need live scoreboards, the NCAA has you covered. Their score center tracks realtime stats and plays in every game. It's a poor substitute for actually watching or listening, but at least you'll know what's happening when it happens.